This method is one of a kind. MY FAVORITE method. It is for the most part auto pilot with only 10-15 minutes a day. 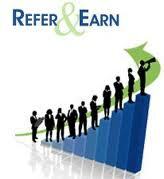 Every day you can achieve about 10-20 referrals. Each referral can make you varying amounts of money based on the website.